Orono Middle School’s Jazz Band is a co-curricular, auditioned ensemble that meets every Wednesday from 7:00-7:50 AM, in addition to extra rehearsals in the months of January-March. Our students perform, and are adjudicated, at the District V Jazz Festival in February, and the Middle School Instrumental State Jazz Festival in March. The ensemble is open to sixth-eighth graders that play one (or more) of the following instruments: alto saxophone, tenor saxophone, baritone saxophone, trumpet, trombone, clarinet, keyboard, electric guitar, electric/upright bass, and drum set. Students are taught improvisation skills, and perform several of the following jazz styles: big band, blues, funk, bop, swing, Latin, ragtime, cool, and/or dixieland. 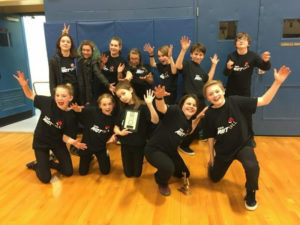 Orono Middle School’s first Jazz Band received a Silver Award for having a 1-rating (score between 90-94 out of 100 points) at the State Instrumental Jazz Festival in 2018. In addition, nine students received 1-rating certificates. Congratulations to all of the OMS Jazz Band! !